← What Happens to the ‘We’ in Relationships? By managing your blood pressure, you can lower your risk of heart attack, heart failure, stroke, peripheral artery disease and kidney disease. (NAPSI)—Fall and winter months can bring busy schedules and seasonal illnesses that make it difficult to manage high blood pressure (HBP). The good news is there are simple, practical steps you can take to manage the condition year-round and enhance your health. Here are 10 tips from the American Heart Association to assist you in maintaining a healthy blood pressure level. 1. Stay informed. It’s estimated that nearly 20 percent of those with HBP are unaware of their condition. This symptomless disease could leave you with substantial health problems. If you don’t know if you have it, see a health care professional to be tested. 2. Take your prescriptions. If you are on prescription medication for high blood pressure, take it regularly and consult your health care provider before taking any over-the-counter medications or supplements. Use a labeled pillbox to help you keep track of your medicines during the busy fall and winter months. 3. Eat a healthy diet. Aim to eat a diet that’s rich in fruits, vegetables, whole-grain and high-fiber foods, and fat-free and low-fat dairy products, and reduce sugar and sodium. If your holiday meal traditions aren’t as healthy as you’d like, modify ingredients or add a healthy new dish to the menu. 4. Get 30 minutes of physical activity most days of the week. Exercise not only helps control your blood pressure, it also helps you manage your weight, strengthen your heart and manage stress. When the temperature drops, find safe, indoor places to exercise. 5. Maintain a healthy weight. If you are overweight, a little weight loss can result in a lot of health gains. 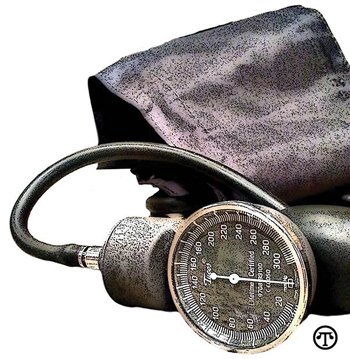 Even a small weight loss—10 pounds—can help to reduce blood pressure. 6. Avoid sudden exertion. People who are outdoors in cold weather should avoid sudden exertion, like lifting a heavy shovel full of snow. Even walking through heavy, wet snow or snowdrifts can strain a person’s heart. 7. Avoid tobacco smoke. Smoking cigarettes increases blood pressure, decreases exercise tolerance and increases the tendency for blood to clot. Make quitting a resolution for the holidays—and stick with it! 8. Stay well. Some illnesses, like influenza, pose added risks for people with heart disease. Wash your hands regularly, and make sure your doctor knows about any medicines or supplements you’re taking in order to make the best treatment decisions. Patients with heart disease should receive the flu vaccine. 9. Read labels on cold medicines. Winter colds may have you reaching for remedies at the drugstore. You should always read the labels on over-the-counter (OTC) medications, especially if you have blood pressure greater than 120/80 mmHg. People with high blood pressure should be aware that decongestants may raise blood pressure or interfere with the effectiveness of some prescribed blood pressure medications. Check the sodium content, too. Some OTC medicines contain more than 1,500 mg—a whole day’s allowance. 10. If you drink, limit alcohol. Men should limit alcohol to no more than two drinks per day and women to one drink per day. Drinking too much alcohol can raise your blood pressure. Your doctor may advise you to reduce the amount of alcohol you drink.